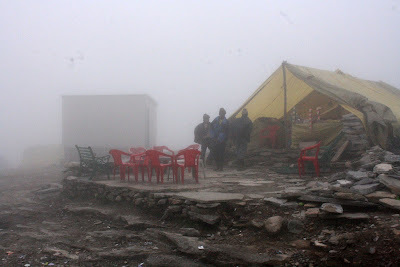 En route to Manali, we passed by a fog-filled Rohtang Pass. 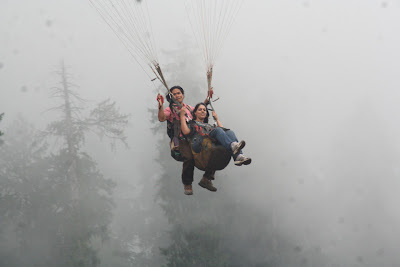 Even amid the dense fog, we were surprised to see people willing to go paragliding down almost invisible trees! Their enthusiasm sure woke us up. 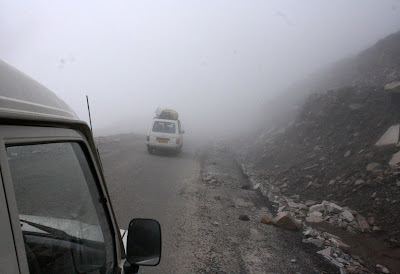 We reached Manali at about 5pm. 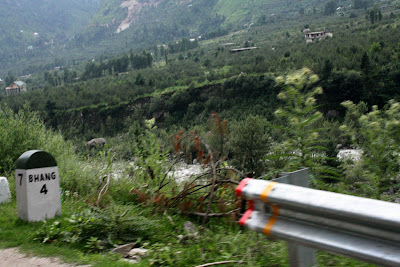 After dumping our luggage at the The Beas Hotel, where we got a room that overlooked the gushing Beas River, we set out to explore some eateries. We settled on Johnson’s Cafe and were pleased to find ourselves at an al-fresco restaurant replete with a cute little garden, patio, stained glass lamps, simple wooden beams and wooden furniture. Our night ended on with some lip-smacking trout, red wine and conversations with fellow travellers. 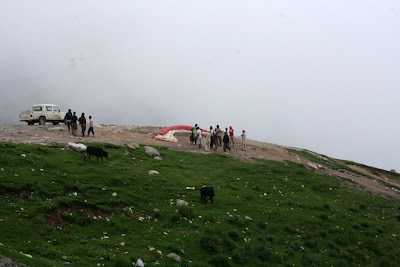 People gearing up to go paragliding en route to Manali. 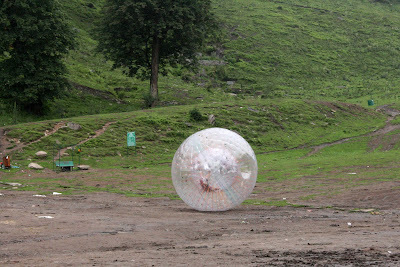 The next day was filled with sheer adventure as we headed on to the Solang Valley to engage in paragliding, zorbing and more such adventurous activities. 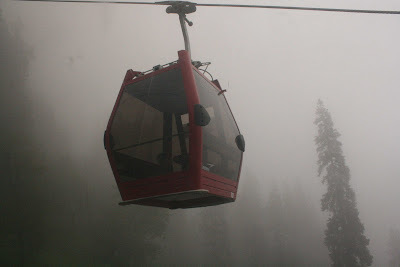 We started with a quiet cable car ride. 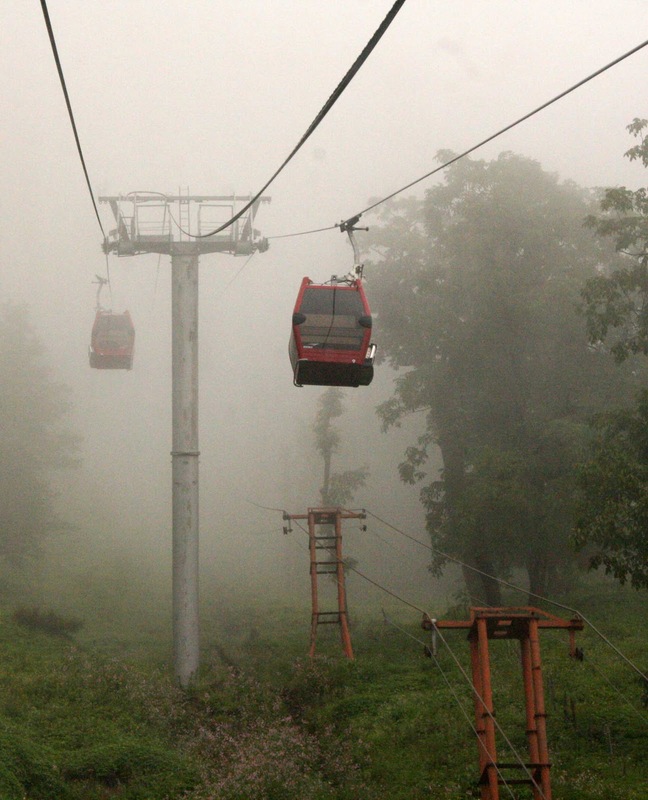 The fact that it was designed by a Swiss company exuded a sense of safety. The ride amid misty fog enveloping the lush green trees—and a light drizzle sent it good measure—was slow and steady enabling us to enjoy the scenic surroundings at a leisurely pace. 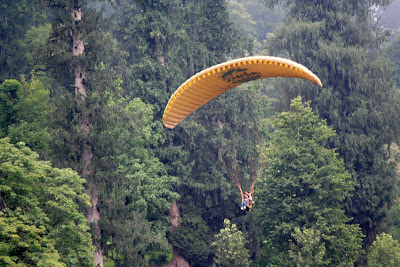 Paragliding was the one thing that all of us in the group wanted to experience. Even though it would be the second time for me and another girl, we were still up for it with the same enthusiasm. There were two different points (with different heights) for the same. We second timers took the shorter trip, while the rest went up higher for the sheer thrill. All went well for the first four gliders, but by the time the fifth glider was up, the fog had covered a large section of the trees, thereby disabling an accurate start. After two failed attempts, he unfortunately had to give it up. 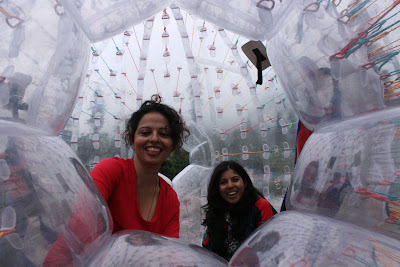 My buddies Hufreesh and Deepti after their zorbing ride. Our glorious trip ended on a ‘high’ note as we headed to Delhi by bus, watching Rajneeti on the little TV screen and translating the same in English for our South Indian mates. Beautiful o beautiful snaps !! !